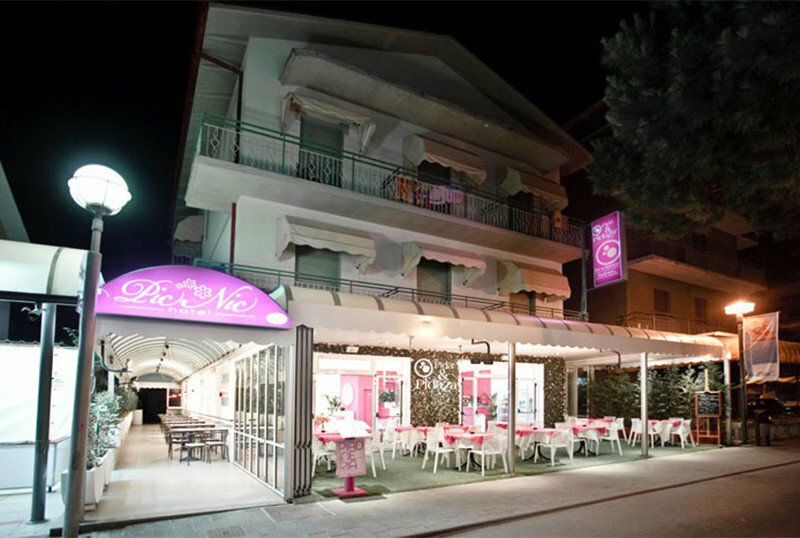 The Hotel Pic Nic is a 2-star hotel in Gatteo Mare equipped with air-conditioned rooms, WI-FI and parking. Suitable for families and equipped for cyclists. Small pets allowed. The property is located in the center of Gatteo Mare, a few steps from the beach and a ten-minute walk from the Don Guanella Gardens, often a frame of events for the whole family. All rooms have a balcony, air conditioning, WI-FI, TV, safe, telephone, private bathroom with curtain or shower, courtesy set, hairdryer. Equipped for cyclists, it has a open-air porch, TV room, reading room, theme nights. Free access to the wellness area of the nearby Hotel Fantini (of the same property) with hydromassage baths, sun terrace, fitness area, sauna. PARKING: open and free, available for all guests. AGREEMENTS : beach, amusement parks, waterslide, swimming pool. PETS : small pets allowed (except cats). LUNCH AND DINNER : choice between three menus based on meat or fish with vegetable buffet. Recipes inspired by the Romagna tradition with homemade pasta and desserts. Water, wine and soft drinks included with meals. CHANGES : vegetarian dishes available. In the hotel: strollers, outdoor playground area. At meals : table seats, baby food preparation, baby menu. The guests of the structure can use the wellness area located at the Fantini Hotel, of the same management and distant 250 m. The wellness area is equipped with a hot tub, a Finnish sauna, a furnished sun terrace and a fitness area. Price list is per person per day for a minimum stay of 3 days. FAMILY PLAN: 2 children under 3 years, one pays 50% and one is free. Offer to spend your Easter at the beach! from the 5th day € 45.00 per person per day. Special offer for the April 25th Bridge! Full board + drinks with meals, starting from € 90.00 per person for 2 nights. Very special for the May 1 Bridge. 2 nights in Soft All Inclusive formula starting from € 90.00 per person. Do not waste your time, book now! Blue Week from 15 to 21 June, in All Inclusive, prices per person for 7 nights. Special prices only for those who book by March 28th. Room for 4 people, 1 child for FREE the second - 50%. Orange Week from 22 to 28 June, in All Inclusive, prices per person for 7 nights.